One Of The Last Shakers, Sister Frances Carr, Dies At 89 : The Two-Way The nearly extinct American religious group with roots in 18th century England has lost one of its last remaining members. 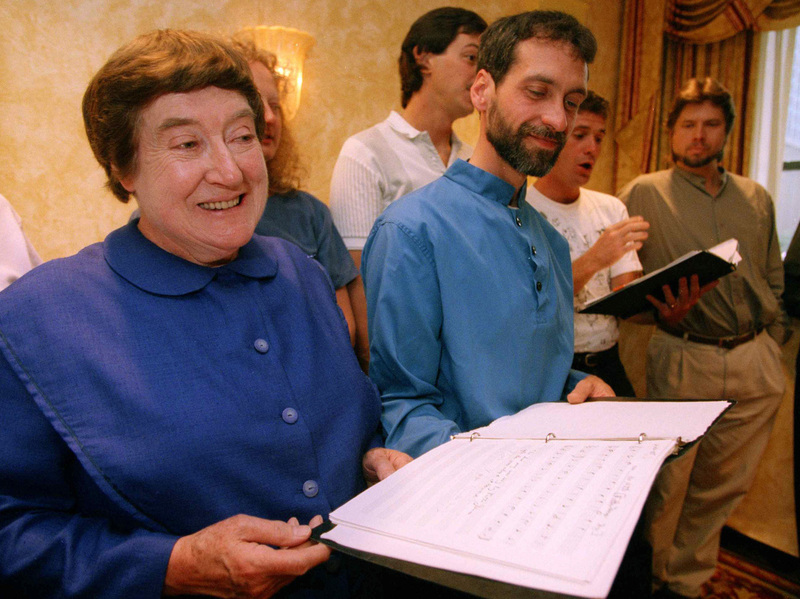 Sister Frances Carr (left) and Brother Arnold Hadd in 1995. Carr died this week, leaving just two members of the religious group known as the Shakers. There aren't many Shakers left. Sister Frances Carr, one of three remaining members of the religious group commonly known as the Shakers, died Monday at the age of 89. According to the group's website, Carr died due to cancer at the Shaker community at Sabbathday Lake in New Gloucester, Maine, "surrounded by the community and her nieces." The group's formal name is the United Society of Believers in Christ's Second Appearing, founded in 1747 in Manchester, England. Critics called them "Shaking Quakers" for their style of worship which included "ecstatic and violent bodily agitation." Persecution led them in 1774 to emigrate to the New World, where they established their first community in upstate New York. The persecution didn't end for the group that advocated pacifism, gender equality, communal ownership and celibacy. Still, the community survived and attracted more than 5,000 followers spread out over 18 communities in 10 states just before the Civil War. Along the way, Shaker communities were credited with creating distinctive furniture and labor-saving devices such as the flat-bottom broom and circular saw. The Shakers' utopian communities declined after the Civil War. What remains today is the Shaker community at Sabbathday Lake. Sister Frances Carr was a 10-year-old orphan when she was left in the care of the Shakers, according to The Associated Press. The surviving members of the religious group are Brother Arnold Hadd, 60, and Sister June Carpenter, 78. Hadd told The Associated Press that even in her final days Carr had hoped that the Shaker community would grow again, and that she would not be among the "last" Shakers.